I will be adding drawings, comics and other projects to this section soon. In the meantime, here are two projects I am working on that you might like to help me with. I have two autoimmune diseases. That means that my immune system incorrectly fights a normal function of my body - in my case, antibodies affect my thyroid hormones. Autoimmune diseases are very common in developed countries, some of them are horrifying and painful, especially because they are incurable and unpredictable. 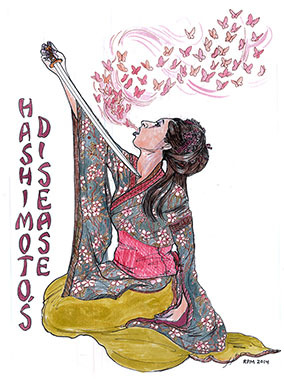 This drawing represents Hashimoto's Disease. I am am working on Graves Disease next, and plan to make more of these allegorical drawings soon, possibly representing Lupus, Multiple Sclerosis, Rheumatoid Arthritis, Crohn's Disease and Diabetes I. Feel free to contact me if you'd like me to try my hand at your "favorite" autoimmune problem.